TVMF is dedicated to ensuring the infusion of bright new medical talent into the veterinary profession by supporting students at the Texas A&M College of Veterinary Medicine & Biomedical Sciences. At the start of each school year, TVMF welcomes the new class of veterinary students by providing them with a stethoscope for use during their education. TVMF Board and staff members enjoy spending time with the new students and welcoming them to the profession. 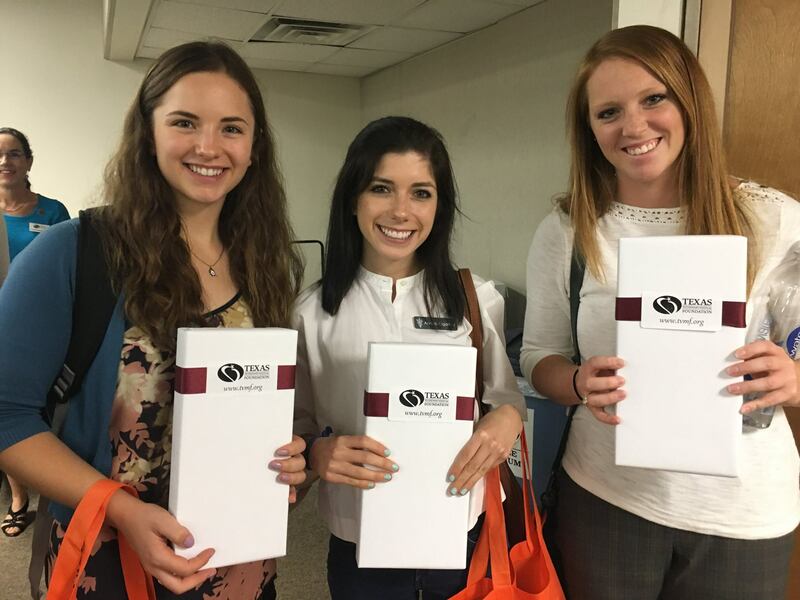 Each summer, TVMF provides two student scholarships to the Texas A&M Veterinary Medical Scientist Research Training Program, exposing these aspiring young professionals to cutting-edge research within the veterinary profession. 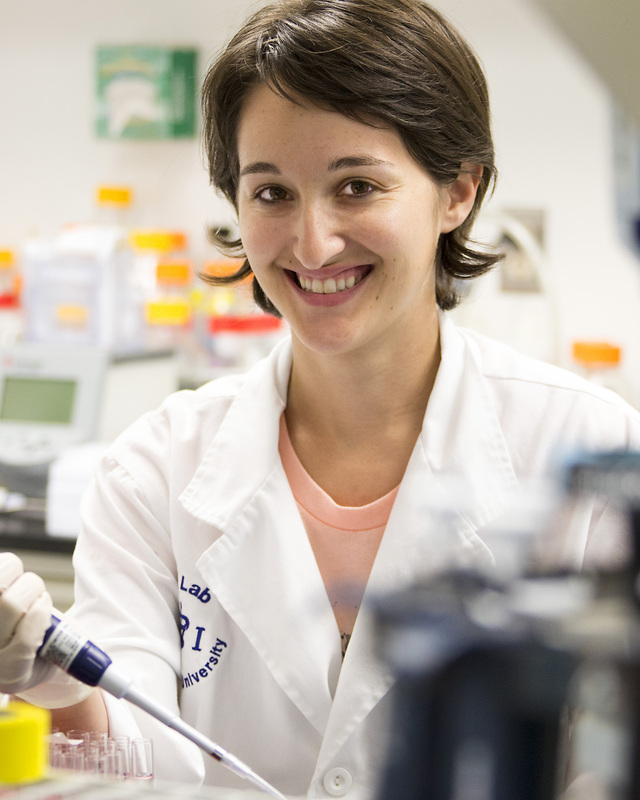 Student fellows conduct full-time research during a 12-week period in the summer under the advice and direction of a faculty mentor. In addition to conducting research, students participate in field trips to other research sites to broaden and enrich their exposure to veterinary research. The program concludes with a research conference and closing banquet. The TVMF Philanthropy Award recognizes service by a professional student at Texas A&M College of Veterinary Medicine & Biomedical Sciences. The award recognizes two students who have been engaged in philanthropic activities and have demonstrated leadership by supporting or starting a charitable program. For more information on the emergency grants, please read the grant guidelines and download an application. 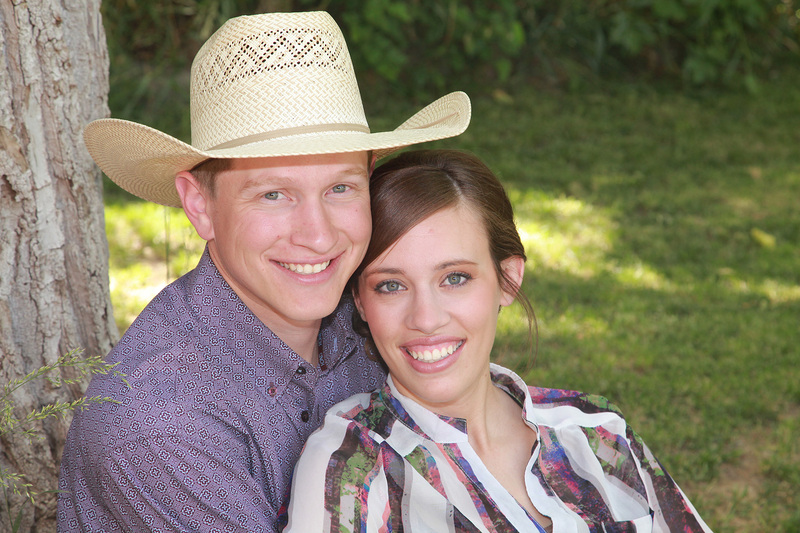 Cade L. is a 4th year veterinary student at Texas A&M College of Veterinary Medicine & Biomedical Sciences. In September 2016 his wife, Katelyn, was diagnosed with breast cancer. Faced with mounting medical bills, including travel back and forth to MD Anderson in Houston, Cade & Katelyn were unsure how they would pay for her treatments. TVMF awarded Cade with an Emergency Student Grant to defray some of their expenses so that Katelyn can receive the treatment she needs while Cade continues his studies at A&M. 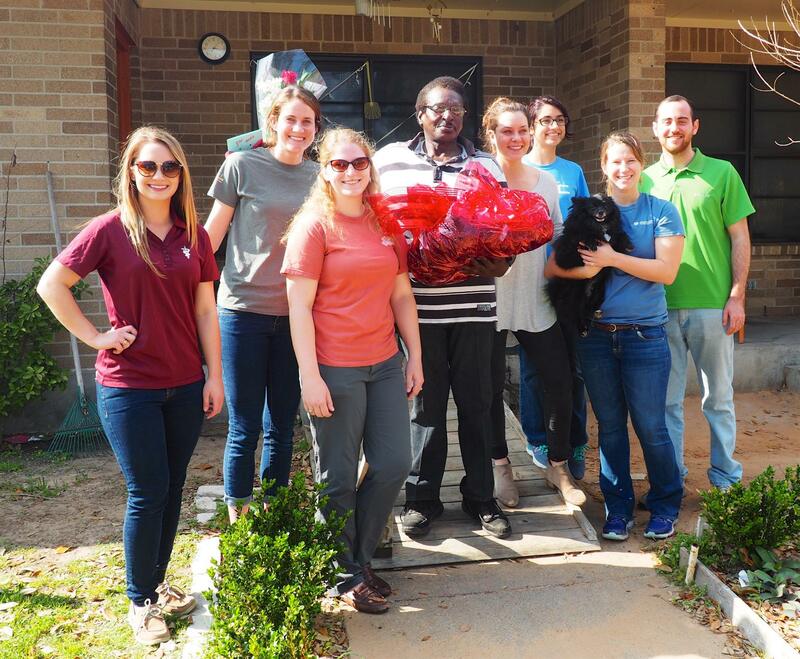 Veterinary students deliver gift baskets to TVMF PALS clients, like Mr. Washington (pictured) and his dog Blackie. TVMF participates year-round in other events that support the college, including Open House, panel discussions, volunteer opportunities, and more.